Indians living in cities is estimated to reach upwards of 40% by 2030. The urban population would be about 600 million people at that point. It is further estimated that the number of cities with populations of a million or more are likely to double in that time. Going by the growth plans envisaged by the current Government, India will need to invest more in its cities to make them more livable. Urbanization is increasing at a rapid pace, and currently about 30-33% of Indians live in cities. This is estimated to reach upwards of 40% by 2030. The urban population would be about 600 million people at that point. It is further estimated that the number of cities with populations of a million or more are likely to double in that time. A large component of this urbanization would in the form of migration to the existing cities, which would expand and grow in size. Unfortunately, most Indian cities are currently decidedly challenged in terms of infrastructure, and their inhabitants' access to basic services continues to be poor. An increase in urbanization will result in more stress and breakdown of these cities; quality of life there will deteriorate. To be able to continue with the required momentum, it is expected that India would need at least 100 new cities over the next 10 years. In developed countries, a Smart City is one where existing infrastructure is augmented, monitored and controlled, leading to highly sustainable development. In the Indian context, the approach is necessarily different. Since many cities lack basic infrastructure, institutional frameworks and proper governance, a Smart City initiative will first and foremost involve providing basic civic requirements and making the infrastructure robust and scalable. Delivery of a variety of services including water, sanitation, education and healthcare. Boosting investment and employment opportunities. Many private investors have also shown interest, as have developers, designers, service providers and consulting firms. There are obviously vast opportunities for private players in every sector on the path of making the mission possible. One must realize that building a city is a very long-term undertaking that takes upwards of 10 to 25 years, so the urban planning must be robust taking into account changes over such long periods of time, interactions with the regional development and interaction with the hinterlands. It is not only important to focus on a single city but on its interactions with the whole region. Economic drivers: Economic drivers are the key for the setting up of a Smart City. A clear plan of vibrant economic growth of the city based on multiple economic drivers must be the focus area of smart city, especially if it is a Greenfield city. Obsolescence of technology: In the Indian context, control of infrastructure and resources is envisaging huge investments in technology. Whilst the investment is a small percentage of the overall infrastructure, all this investment is being done with a horizon of between 5-10 years - and technology leapfrogs in much shorter times than that. For example, we have quickly moved from 2G to 3G and on to 4G, from a wired world to a wireless world and from cables to optical fibers. Technology evolves faster than a city, and there must therefore be options to adapt as technology changes or gets obsolete. Technology protocols must be amenable to modification and upgradation. Urban mobility: A smart city encompasses many dimensions, and a reliable, affordable and sustainable transport system is at its core. Along with public transport systems, development of last-mile connectivity is necessary for optimal utilization of mass transit systems. This is why Smart Cities around the world think about urban transport in a comprehensive manner to improve accessibility and mobility. India's public transport has not been adequate because of the high density of population, poor urban planning and zoning and also lack of investment. As we build new cities, public transport must be the key focus. A new city's mobility system must be integrated with the regional transport system and may need augmentation of existing regional infrastructure. For instance: Pune's MIDC has a developed an infrastructure network; however it is not matched by the municipal networks, resulting in bottlenecks. In another example, Lavasa as a city requires external transportation links, which implies that Smart Cities cannot plan and invest in matching regional infrastructure. This would devolve on the state or national infrastructure planning authority. Water management: The Water Cycle (water resource, production, distribution, consumption, collection and treatment of waste water) plays an integral part of an urban system. Water and its sustainability are of key importance in new cities, which must aim to be water neutral or positive as much as possible. Waste management: Sustainability in solid waste management calls for a new approach to solid waste and converting it as a resource. There is a need for solid waste management through smart solutions for clean roads and a healthy environment. Unfortunately, India has just not woken up to this. Cleanliness and hygiene call for a baseline cultural change. Technology could help; however, the upfront investment in some of these technologies or the minimum scale investment is high. Nevertheless, it is imperative that this be planned for. Social infrastructure: A city needs social infrastructure for making it habitable, and most of this social infrastructure needs a critical mass of population and consumption to be viable. This means that in the initial years, participation of private enterprises would be limited. It also means that to start a new Greenfield city, either the projects need to be funded by the promoting government or subsidized. City planners need to plan accordingly. Funds: A new city would take a long time to develop both the requisite economic drivers and the infrastructure - only after that will it see people stepping in to stay. By the time the city is habitable and has a basic population, the project would at least be 7 to 10 years in the making. Unfortunately, the current funds available for this sector are only for the short-term of 10-15 years. Unless the development of the city is done out of funds that have a 20 to 30 year horizon, these projects are unlikely to survive. India needs a sea change in the way it looks at funding these cities, or their infrastructure. Employment generators: It is important to plan along with the regional planning and Government on job creation in these cities. A critical focus on job creation is not only on the primary economic jobs created, but on service jobs. The city has to be serviced by people working on the support infrastructure. Rental housing: There is considerable need to develop a rental housing market to ensure that more people can move in and work in a smart city without needing to buy properties there. The real estate laws for a Smart City must be such that investors will come in and provide rental residences to people who move in to stay there. Phasing: A Greenfield Smart City must necessarily be built in phases on the basis of real demand, and demand should drive investments beyond the basics. Otherwise, we will wind up with ghost cities where infrastructure has been built, but with no takers. Maintenance: Building a Greenfield city is relatively easy; however, it is continuous maintenance which differentiates a great city from the rest. Smart cities should be easy to maintain and be taken care of to extend, modify and accommodate the growing needs of citizens. Smart cities need to be smart for the long haul, not only at the outset. 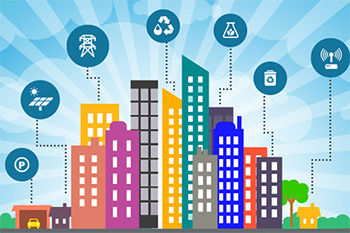 As much as the vision of Smart Cities in India is both vast and rational, their implementation within the context of existing socio-economic conditions might be a tad difficult. However, as a rapidly developing economy, the country must doubtlessly keep up with global standards. The execution of the Smart Cities plan can take India onto a major leap forward in the race of development, so no efforts must be spared to make them happen.